Hammer Museum Courtyard. Photo Credit: Brian Champlin / We Like L.A.
You know what’s handy? Waking up in the morning, firing up your phone/computer and being able to scan a super quick (but curated) rundown of the best of what lies ahead. So here it is, our list of fun things to do in Los Angeles for today, Wednesday, February 13, 2019. 1. [10 a.m.] 260LA will host a J Brand sample sale from February 13-17 in their Beverly Hills location. 2. 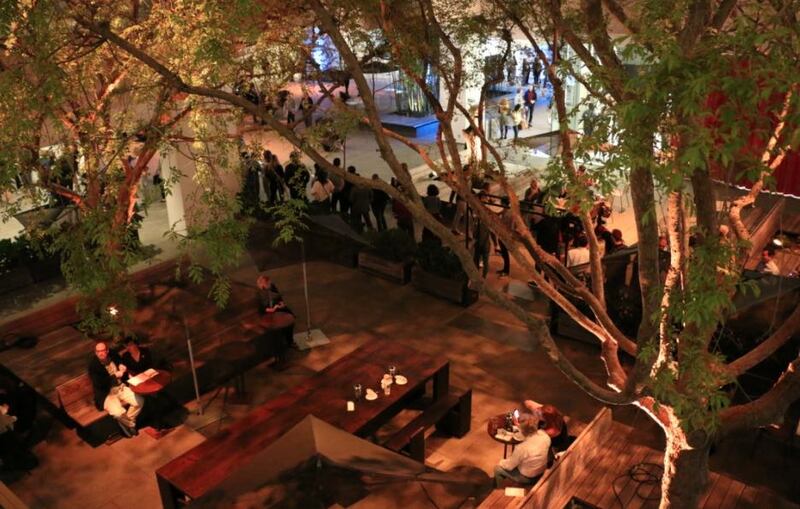 [6 p.m.] Art Los Angeles Contemporary comes to Barker Hangar in Santa Monica February 13-17. Tonight is the opening reception for the event. 4. [8 p.m.] Lucha VaVOOM’s 2019 Valentine’s Show returns to the Mayan Theater in Downtown Los Angeles February 13-14 for an action-packed variety show where there will be Mexican masked wrestling, burlesque and comedy all in one majestic space. 5. [9 p.m.] Sad Bastards Nite at Bar Henry is a special night for the melancholy with tunes to match and anyone who can prove a recent tragedy—including job loss or divorce—will receive a free drink. 6. [various] Saved By The Max, the Saved By The Bell Pop Up Shop Diner & Bar will transform into Malibu Sands & Zack’s Room as part of the “final semester” of the pop up experience wrapping up in April. 7. [various] Severance Wine Bar wants to celebrate your single status during their BREAKUP BAR POPUP. Taking place next door to the bar, the two week long party will transport guest into an anti-Valentine’s Day world with break up appropriate movie screenings, a Wall of Broken Relationships, loads of champagne, cocktails and food. Running Tuesday through Saturday till February 14. 8. [various] From February 4 through March 1 The Grove offers a special “Award Nominated Date Night” in honor of awards season. Guests will enjoy an award-nominated film and a three-course dinner at The Grove, as well as valet parking for the evening for $70. This promo is not available on Valentines Day. 10. [various] Desert X returns for its bi-annual public art show February 9 through April 21. Spread throughout the Coachella Valley in various locations, artists are commissioned to use the desert landscape as their canvas with breathtaking results. #SPONSORED DEAL OF THE DAY: Save up to 55% now through 2/17 when you book tickets for the ALITA: BATTLE ANGEL – Passport to Iron City immersive experience.